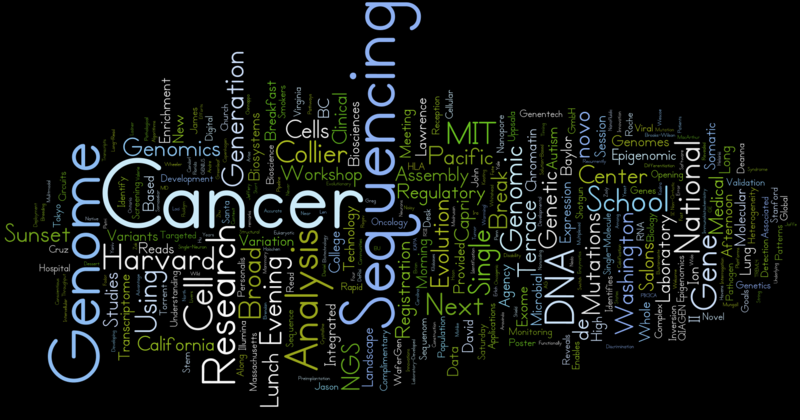 -Single cell genomics is becoming an extremely useful tool, we’re eager to hear more on the first day of the meeting. – Her talk was the most tweeted plenary lecture during ASHG 2013 and it was great! A must go! – Dr. Eichler studies gene duplication and DNA transposition within the human genome. This is going to be a good talk. – The paleogenomics section of the recent PAG conference was excellent. I expect this to be an interesting lecture as well. – Lots of good RNA-Seq talks. Dr. Kohn’s single cell sequencing approach is described here: Single-neuron transcriptome and methylome sequencing for epigenomic analysis of aging and here: Single-cell semiconductor sequencing. Stephen Fodor, Cellular Research, Inc.
– What’s next from the founder of Affymetrix? For a preview check out their paper that came out this month on molecular indexing for quantitative targeted RNA-Seq. – Looks interesting. Hoping to get a preview from his blog: CoreGenomics. – Expecting to see some of the first Nanopore data here ! – The latest NGS platform, Genapsys just got $37M in series B financing. Genohub will be in attendance and tweeting @Genohub. Send us a message and let’s meetup to talk NGS ! This entry was posted in Genohub News, Genomic Digest, High Throughput Sequencing Currents, High Throughput Sequencing Resources, Next Generation Sequencing Market, Uncategorized and tagged 15th annual Advances in Genome Biology and Technology (AGBT) meeting, AGBT 2014, AGBT Agenda. Bookmark the permalink.